Our favourite count certainly knows how to to party like it’s 1761, but in terms of products celebrating Faber-Castell’s 250th anniversary there hasn’t been a lot. The anniversary pencils, discussed at pencil talk, seem to be the best products so far. Artists might like the set of coloured pencils, limited to 1761 boxes, and if you have a bit more money to spare the Elemento pens, released for the anniversary, might be just the thing for you, but they are out of reach for most of us. 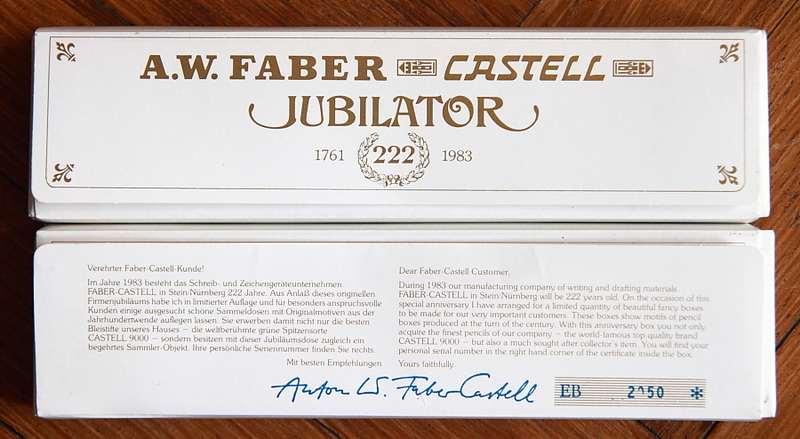 Let’s have a look at Faber-Castell’s 222nd anniversary in 1983. Back then pencileers, molyvophiles1 and molyvologues2 had more than enough reason to celebrate. I wonder whether there was a corporate party for their business partners in 1983, too. Personally, I prefer nice anniversary products, but that’s rather selfish, Faber-Castell business partners will probably prefer the party. Why is the 222nd anniversary so important? I don’t know. I certainly don’t know why there have been more exciting products back then than in the 250th anniversary year so far. In my experience people from German-speaking countries place more importance on Schnapszahlen (repdigits) than people from English-speaking countries. You might argue that a repdigit is not very important, but then a ’round number’ is actually not that exciting any more once you change to another positional notation3. 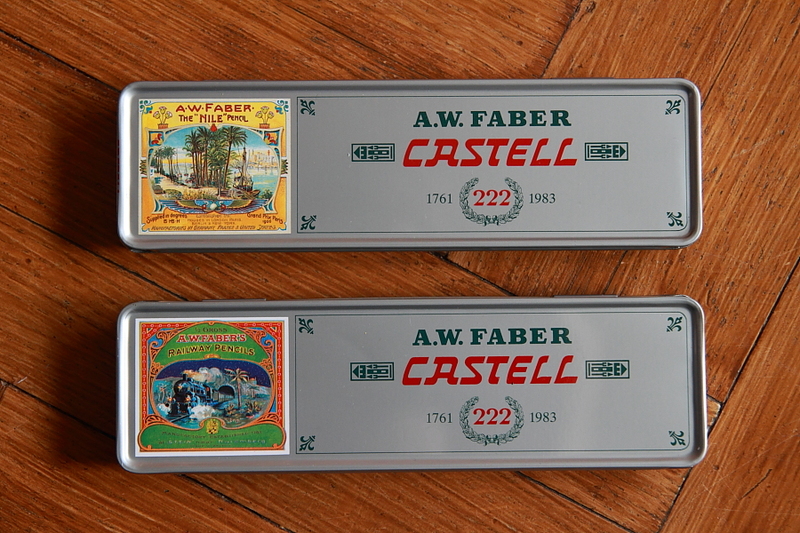 Faber-Castell released six different limited-edition tins for the Schnapszahl anniversary, featuring the following images: ‘The Nile Pencils’, ‘Railway Pencils’, ‘Aristocratic’, ‘The Caravan Pencils’, ‘Landscape Pencils’ and the picture with the jousting knights, previously discussed at pencil talk. Leadholder has more information about this picture – a mirrored version has been used on pencil tins in the early 20th century. 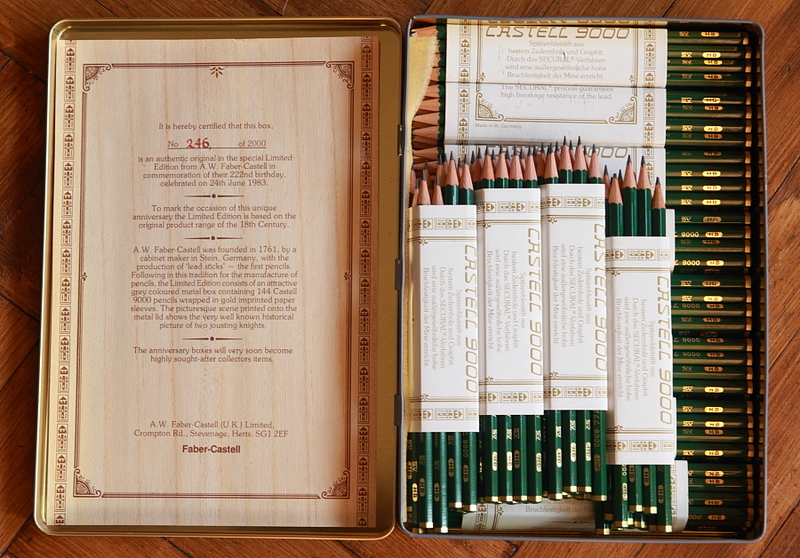 The jousting knights image has also been used for a special box from the same year, containing one gross, i.e.12 dozen, Castell 9000 pencils and limited to 2000 boxes, and it has been used again in 2005 for a special tin commemorating the 100th anniversary of the Castell 9000. Very exciting! These items look great and – at least to me – much better than the current anniversary pencils. Especially the Castell 9000 Jubilator pencils are very appealing with their slanted “9000” and their fancy “JUBILATOR” lettering 🙂 The old green is beautiful, and besides that it is great that the colour of their cap matches the one of the imprint. Great post and pictures! As it has been said, it’s great to see the 9000s in different contexts. Both the large and small tins look really nice too (and numbered, no less). I wonder if each country had their own tins. For example, this looks to be a British item (or at least, the special insert was printed for distribution in the U.K.). Do we know if there were concomitant French and German versions? I’m sorry if my english is not the best, I’m learning it. Thanks for your patience. This is what I call an anniversary edition, what a beautiful tins, something that catch my attention is the 2005 tin it clearly changes the stylized castle. What a “teasure box” you have there, a complete gross of Castell 9000, congratulations!. 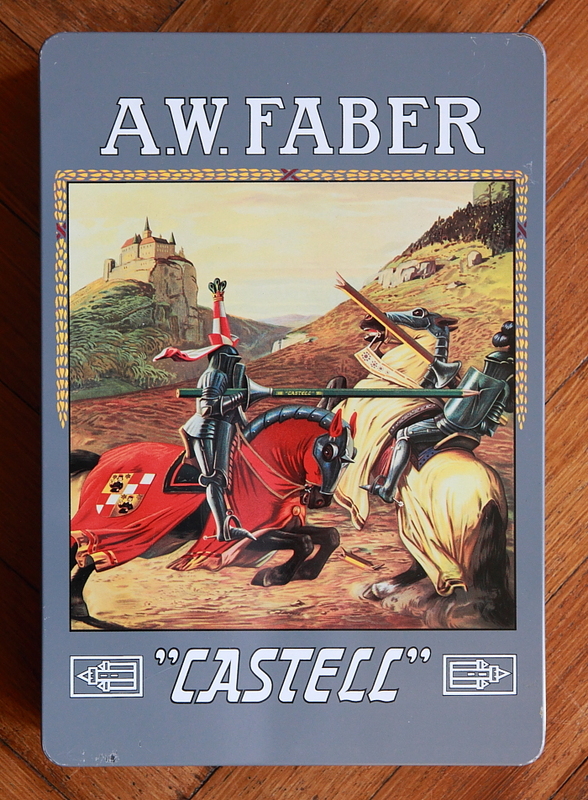 I hope someday, to get a full color tin with the “jousting knights” as Faber-Castell called them. I saw these tin boxes on ebay but, the cost of mail to South America would been apprehensive. Never saw these in Australia and of course 1983 and to some extent 2005 was before online selling took off – at least for me anyway. I’m not a purist though, preferring the current Pine Green colour.. but in these 1983 special editions the military green really does look fantastic. Thanks for showing these beautiful pencils. I wasn’t aware of Schnapszahlen – is an 11th anniversary of an event thus considered a significant anniversary, on par with the 10th? Thank you for the links to my blog. I’m wondering if some of the older content should be archived. Gunther, the colour of the cap does match the imprint as they are both golden, but the imprint is glossy while the cap is matt – a bit like the current Castell 9000 pencils, just with the cap being golden, not silver. Sean, that’s an interesting question. I asked Faber-Castell, maybe they do know the answer. I previously asked how many Jubilator tins there were, but this information doesn’t seem to be recorded. Kevin, I think the colour on the photo is a bit deceptive. The weather was horrible when I took these picture and I didn’t use a flash, so the light changed all the time. Under most light conditions the green of the Jubilator would feel darker than on this picture. Stephen, I would say (others might disagree) that under 100 Schnapszahlen are not as important as multiples of ten (so 11 is not as exciting as 10), but above 100 a number like 222 feels more special for many than a number like 220. I am not sure what you mean by ‘archived’, but I hope your old content stays online. I have spent many nice hours after discovering your blog, Gunther’s blog and Dave’s blog, all of which were well established when I found them, reading old articles. Claire, it’s really nice. I wonder why they mirrored it. Matthias, thank you for the details. 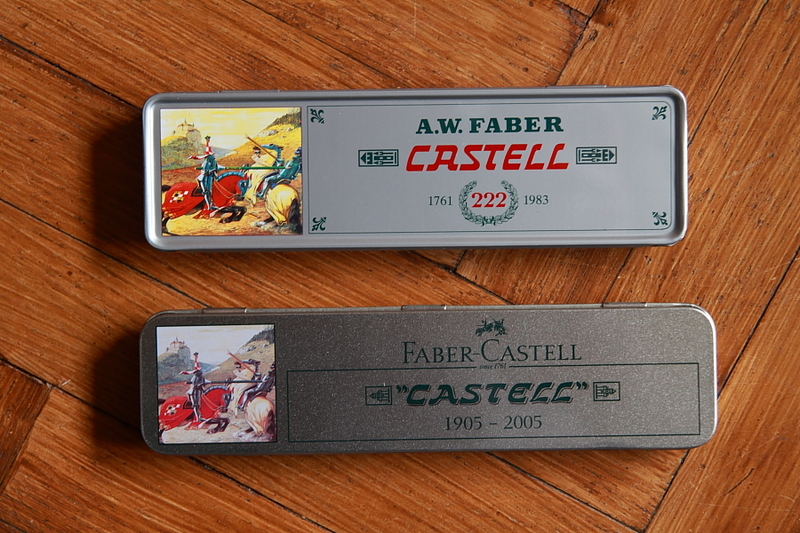 – I wonder what has caused Faber-Castell to switch to a silver tone for the cap. Stephen, just a small detail regarding the Schnapszahlen: In 1995 Staedtler have celebrated their 333rd anniversary and sold a retro tin with a printed inlay that featured that number. As far as I know they also had a Lumograph with a special imprint (but I am not sure). Matthias, I’m not completely sure either what I mean by “archive”. Gunther, thank you for that interesting Staedtler Schnapszahlen detail. This must be part of the events that resulted in a lawsuit from Faber-Castell. So next year will 350 years since the registration of Friedrich Staedtler as a pencil maker. I wonder if there will be a commemoration? So next year will be 350 years since the registration of Friedrich Staedtler as a pencil maker. I wonder if there will be a commemoration? Despite being a bit baroque, that is a majestic-looking pencil. Stephen: Thanks for the link to the rivalry story, it was a good read. That’s certainly an impressive looking pencil! Sean, you asked earlier about a French or German version. I asked Faber-Castell and they just replied and told me that there was a German version of the large ‘one gross’ box. Futural, sorry, somehow your comment ended up in the spam folder, I just approved it. 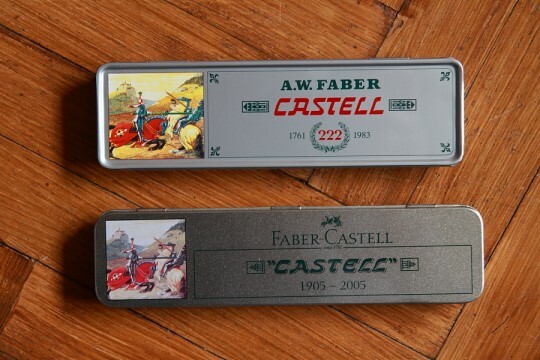 There used to be an eBay seller from Cypress who sold the nice Castell tin from 2005 for a very good price – and the shipping costs were quite low, too. Michael, you might increase your chance of getting a response if you state a price.